Two second-half goals by junior Ashlee Elliott gave the No. 16 Florida soccer team (5-2-1, 0-0 SEC) a 2-1 win over No. 25 Kansas (6-2, 0-0 Big 12) Sunday afternoon in front of a James G. Pressly Stadium crowd of 1,278. The match was the final of the non-conference schedule, as league action begins next Friday for both teams. The Gators were forced to come from behind after the Jayhawks scored first at 58:43. A pair of KU juniors combined for the first goal of the match. Monica Dolinsky sent the ball across the field, finding Shannon McCabe. She dribbled and then placed her shot in from 10 yards. The Florida attack showed more urgency after the KU goal. After some near chances, Florida knotted the score at 65:24. The ball looked to be going out at the endline for a KU goal kick but freshman Tahnai Annis saved the ball just before it crossed the line. She flicked the ball over her left shoulder back to the center of the box. Elliott headed the ball into the center of the goal for her first score of the season. A change by Elliott in her normal run resulted in the goal. Elliott’s second score of the match started with Ameera Abdullah’s throw-in from the right touchline. The ball deflected off a KU defender’s leg and end up by Elliott above the box. Her 25-yard, left-footed shot went in untouched at the center of the goal right below the crossbar. Although the assist officially was credited to Abdullah, Elliott gave a long-distance assist to her mother, Betsy, in California. It was the first multi-goal match of Elliott’s career. A member of U.S. Under-20 and U-23 National Team Player Pools, Elliott is a player that can make her presence known in a match, UF Head Coach Becky Burleigh said. Sophomore goalkeeper Meghan Berlingo turned in a career-high five saves Sunday, including a pair of one-handed second-half saves. In the 56th minute, Berlingo was on the ground due to collision in the box, but rose up to knock down Kortney Clifton’s five-yard shot. Later in the half, KU’s Kim Boyer took a 25-yard shot. Berlingo just got her hand on it to tip it over the crossbar for a Jayhawk corner kick at 77:05. It was an unusual away-home weekend for the Gators. They played at No. 5 Portland Friday evening (losing 2-0) and took the red-eye flight back from Oregon, returning to Gainesville early Saturday afternoon. The Gators looked laggard Sunday, but junior Lauren Hyde knows that creating energy will be vital for the challenges of the upcoming conference season. Next up, Florida opens Southeastern Conference action by playing host to Georgia on Friday, Sept. 26. Match time is set for 7 p.m. (ET) at the James G. Pressly Stadium and admission is free. Florida and Georgia were the top two teams in the 2007 SEC standings (Florida No. 1 at 9-2 and Georgia No. 2 at 8-1-2). The first 1,000 fans will receive a Gator soccer t-shirt compliments of SUN Sports and Friday’s match is live on SUN Sports. The match can also be heard live on WRUF AM 850 with Adam Schick and Matthew Stubbington covering the action. 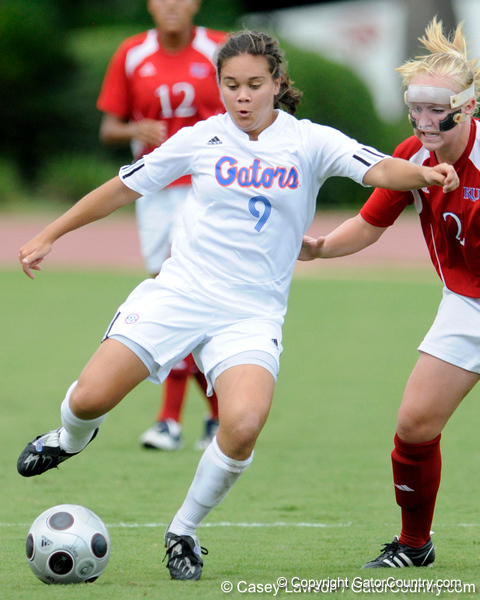 Florida freshman midfielder Tahnai Annis fights for position during the Gators' 2-1 win against the Kansas Jayhawks on Sunday, September 21, 2008 at James G. Pressly Stadium in Gainesville, Fla.